Amazon Price: $378.00 $169.99 You save: $208.01 (55%). (as of October 12, 2017 10:04 pm - Details). Product prices and availability are accurate as of the date/time indicated and are subject to change. Any price and availability information displayed on the Amazon site at the time of purchase will apply to the purchase of this product. Designed to make you feel fabulous! This statement necklace is a must-have for any bold jewelry wardrobe. 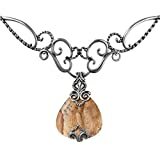 Fashioned from sterling silver in a classic rope and scroll design, the necklace can be worn alone, with the included picture jasper enhancer, or most other enhancers in your collection. The distinctive color of picture jasper is accented with a sterling silver scroll design on both the front and back while the snap hinge bail make the enhancer easy to remove and pair with other necklaces in your jewelry wardrobe. *Note: Color may vary due to characteristics of the natural stone. Featuring gemstones from around the world, our jewelry is proudly made in America with US and imported parts. We do our part for the environment by crafting our jewelry from recycled .925 sterling silver.